Head injuries can vary from a mild bump on the head to severe brain injury. 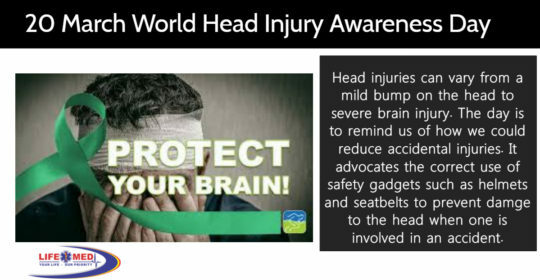 The purpose of World Head Injury Awareness Day is to remind us of how we could reduce accidents and brain injuries. It advocates the correct use of safety gadgets such as helmets and seat belts, which can prevent damage to the head when one is involved in an accident. Globally every year more than 5% of people suffer a serious brain injury after an accident or as a result of accidentally bumping their head. An estimated 89 000 cases of new traumatic brain injuries are reported annually in South Africa. The three most common causes of head injuries are a motor vehicle, bicycle or vehicle-pedestrian accidents (50%), falls (25%), and violence (20%). Remember that if you spend one more moment being mindful of your surroundings you can avoid spending a lifetime living with disability due to head injury.